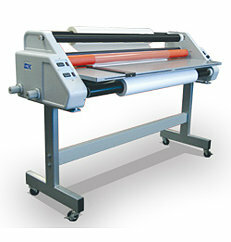 The EXP 62 Plus Laminator is a 62” wide version of the popular EXP 42 Plus. This laminator offers you the perfect finishing solution, with its’ easy to use display and the versatility of using either pressure sensitive or thermal laminating films, the EXP 62″ Plus Laminator is the perfect machine for all your wide format finishing needs. With the heated rollers you will get scratch-free graphics designed for mounting and laminating low temp thermal and pressure sensitive films. The independent upper and lower electronic temperature controls with LED display with “Ready/Wait” lights the machine indicates when laminator has reached preset temperatures. The EXP 62 Plus Laminator is a heavy duty machine that comes equipped with four high capacity forced air cooling fans to prevent the machine from overheating. The spring-loaded adjustable pressure on the laminator pulls the rollers to provide a smooth and high quality results every time. The EXP 62 features a heavy duty stand with castors that make it easy to move around the shop and offers the ideal height for operator comfort. However, there is an optional footswitch available which provides a hands-free operation for guiding materials during lamination. This machine can laminate up to 10 feet each minute and it accepts low-melt, thermal and pressure sensitive films. The EXP 62 also accommodates substrates up to 1/2” thick and rolls up to 8” diameter for all of your wide format finishing needs. If you have any questions or are interested in purchasing the EXP 62 Plus Laminator, visit Spiral Man at SpiralBinding.com. They have great pricing on a full line of Wide Format Thermal Laminators. Call us at 1-800-631-3572 for more information!